For those too nervous to board an airplane, there are no fly vacations. I understand this nervousness associated with flying and only fly when I must. For people like you and me, there is good news! One does not need to fly to be able to enjoy the beauty of God's creation - beaches, landmarks, people, etc. You can see it all by cruising, driving, taking the train or a combination of two or more methods. 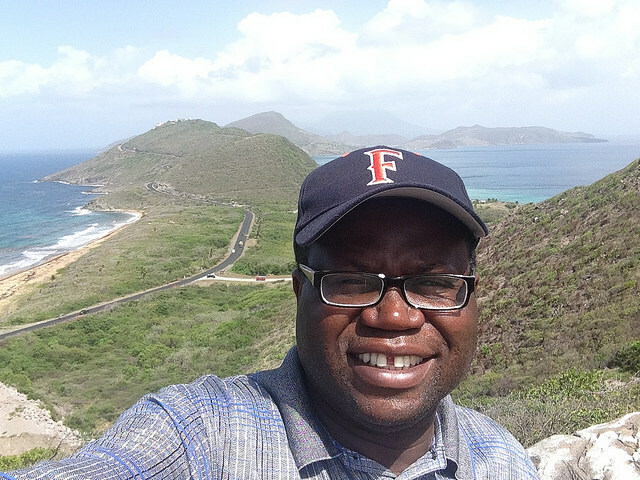 I'm On Hill In St. Kitts With Atlantic Ocean and Caribbean Sea Behind Me. For those of us living in the United States, we are privileged to have the homeports of cruise ships located within a five-hour drive for most people. 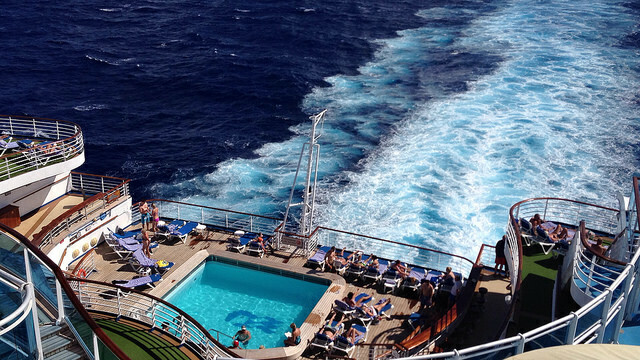 Cruising offers a powerful way to see the world, without flying. You can go from the east coast to the west coast on a cruise ship - cutting across the Panama Canal. You can go from North America to South America without flying. You can go from the United States to Europe without boarding an airplane. You can go from the USA to Africa or Asia without visiting an airport. As mentioned above, top cruise lines have strategically positioned their ships' home-ports to help you onto a luxury cruise liner with little hassle and to keep you away from the airplane. In the far northeastern corner of the United States is the Boston Cruise Port. This port is only a five (5) to six (6) hours from major cities in states neighboring Massachusetts. This means that guests from Maine, New Hampshire, Rhode Island, Connecticut and Massachusetts can complete no fly vacations from Boston. Currently, the Boston Cruise Terminal offers cruise itineraries to New England, Canada and Bermuda. Cruise lines sailing from Boston include Holland America, Norwegian Cruise Line, Princess Cruises and Royal Caribbean International. Heading south from Boston, gets one into New York and to two cruise terminals - the main one in Manhattan and a Brooklyn terminal with limited and occasional sailings. These cruise terminals are ideal for guests driving from Connecticut, New Jersey, Pennsylvania, Maryland and of course New York. 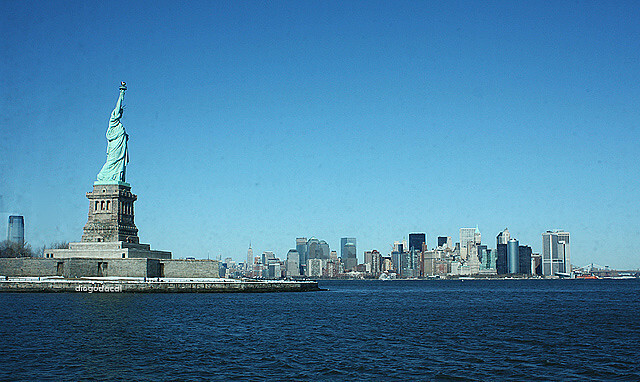 The two ports in New York offer several no fly vacation options. 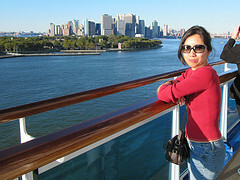 From the Brooklyn Cruise Terminal, guests may board an occasional Princess cruise liner to New England and Canada. From the Manhattan Cruise Terminal, guests may plan no fly cruise vacations to The Bahamas, the Caribbean, New England and Canada and even transatlantic sailings. Some cruise lines currently offering cruises from New York include Carnival, Crystal Cruises, Cunard, Holland America, Norwegian Cruise Line, Oceania Cruises, Regent Seven Seas and Princess Cruises. Not far from the New York ports, you'll find the Cape Liberty Cruise Port in Bayonne, New Jersey. Also centrally located to the New York region, this port offers no fly vacations to many people living in the northeastern states of Connecticut, Maryland, Pennsylvania, Delaware, New York and New Jersey. From Cape Liberty, you may book inclusive cruise vacations to The Bahamas, the Caribbean, Bermuda and to New England and Canada. Cruise Lines currently doing business out of the Cape Liberty Cruise Port include Celebrity Cruises and Royal Caribbean International. Heading south from New Jersey, along the northeastern seaboard will get you into Maryland and the Baltimore Cruise Port. This port is fast becoming quite popular, as it allows families in several neighboring jurisdictions to get on a cruise liner without boarding an airplane. Guest from the Washington DC area, Delaware, Virginia, West Virginia, Pennsylvania and New Jersey can board a cruise ship from the Baltimore Cruise Terminal. Carnival Cruise Line and Royal Caribbean are currently the only cruise lines based in Baltimore, Maryland. As you continue south along the eastern coast of the United States, you will get into Norfolk, Virginia. While somewhat limited in cruise offerings, guests from neighboring states can plan to sail out of Norfolk with Carnival Cruise Line. Itineraries from Norfolk are largely to The Bahamas. Leaving Virginia and traveling to South Carolina brings one to the Charleston Cruise Port. As with Norfolk, Carnival Cruise Line is currently the only cruise line operating from Charleston. 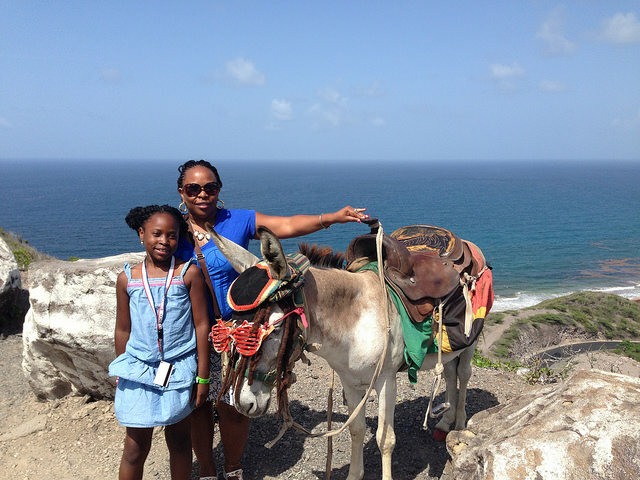 Families can find no fly vacations from Charleston to the Caribbean and The Bahamas, with limited itineraries to Bermuda. We are now entering Florida, the home of several cruise ports and many no fly vacation opportunities. In far northeastern corner of the state, you will find the Jacksonville Cruise Port (JAXPORT). 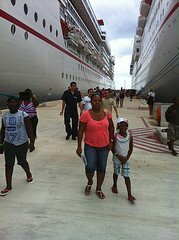 From here, families can board a Carnival Fun Ship to The Bahamas. Jacksonville is ideal for guests driving from North and South Carolina, as well as from Georgia. Port Canaveral is a popular cruising port, about fifty (50) miles east of Orlando. 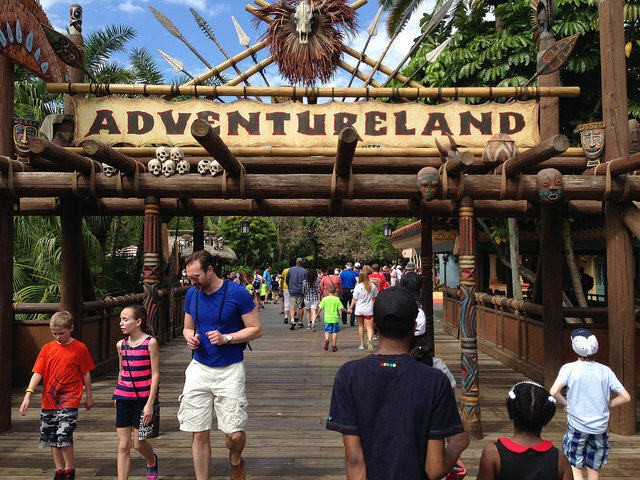 Many people travel from all over the United States by train, bus or car to visit Walt Disney World. Now you know that you can do an additional short drive to Port Canaveral, home to several of the most popular cruise lines that sail to the Caribbean. From this port, you are able to catch a Disney, Carnival, Norwegian, or Royal Caribbean Cruise. From Port Canaveral, you can try several options of no fly vacations. There are itineraries to The Bahamas, the Eastern Caribbean, Western Caribbean, Southern Caribbean and even an occasional transatlantic sailing from this popular port. Heading south from Port Canaveral, one gets into Port Everglades - popularly known as the Ft. Lauderdale Cruise Port. This port competes with the one in Miami as the most popular or the busiest cruise port in the United States. The Fort Lauderdale Cruise Port offers several cruise lines with interesting and exciting itineraries to several parts of the western hemisphere. 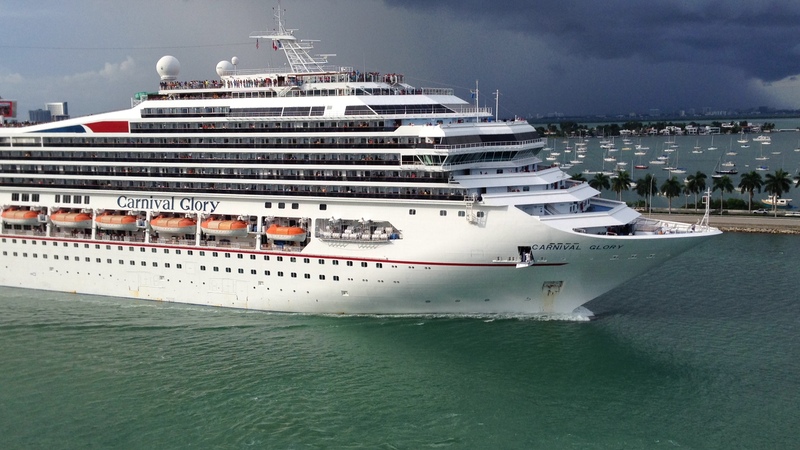 Plan to catch a Carnival Cruise Line sailing, one from Celebrity Cruises, Holland America Cruise Line, Crystal cruises, Royal Caribbean International, Princess Cruises and others from this busy port in south eastern Florida. From Fort Lauderdale, you can visit places like the Panama Canal. Take a cruise through the canal to California, take a cruise to the southern Caribbean, take a cruise to the Eastern Caribbean, take a cruise to the Western Caribbean, take cruises to The Bahamas, and even transatlantic cruise sailings. South of Port Everglades or the Ft. Lauderdale Cruise Port we find the Miami Cruise Port. 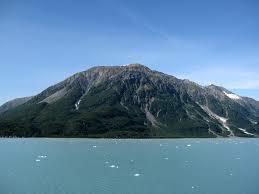 As noted above, this is the busiest or second busiest cruise port in the United States. 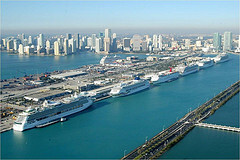 Like Port Everglades, the Port of Miami offers several cruise lines sailing to many exciting and exotic destinations. You may plan to catch a Carnival cruise, a Disney cruise, a Royal Caribbean Cruise, a Celebrity cruise, a Norwegian cruise, an MSC cruise, and others from the Port of Miami. No flying vacation options offered from this port include sailings to the The Bahamas; Eastern, Western and Southern Caribbean; the Panama Canal to Mexico's Pacific coast; and even occasional transatlantic itineraries. Leaving Miami and heading north along the western coast of Florida brings you to the Tampa Cruise Port. This port has its own collection of popular cruise lines offering no fly vacations to destinations in the Caribbean. From Tampa, one can board a Carnival cruise, a Norwegian cruise, a Princess Cruise, a Holland America Cruise, or a Royal Caribbean cruise. Cruise itineraries from Tampa are largely to exciting ports of call in the Western Caribbean, with stops in Mexico, Honduras and Belize City. 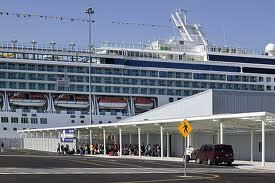 For those closer to central coastal areas, there is the New Orleans Cruise Port. Guests from Alabama, Mississippi, Louisiana, Oklahoma and elsewhere can take a fairly short drive to New orleans, Louisiana and get on a luxury cruise ship. This port is currently home to the world's most popular cruise line, Carnival Cruise Line and Norwegian Cruise Line, both offering itineraries to the Caribbean, Mexico and Central America. In addition to Caribbean cruises, one can board river boat cruises in New Orleans. There are several no fly vacation options from this port. Heading west from New Orleans will bring you into Texas and to the Galveston Cruise Port. 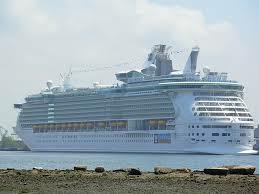 This is fast becoming a highly popular departure port for many people looking for a cruise vacation getaway. The Galveston Cruise Port currently hosts popular cruise lines such as Carnival Cruise Line and Royal Caribbean International. Residents of Texas and neighboring states can take the drive to Galveston and catch an exciting Caribbean cruise from this port. Residents near Texas can also enjoy the luxury of a second cruise embarkation point - the Houston Cruise Terminal. You can currently board a Princess or Norwegian cruise ship from Houston to the Caribbean. For those closer to California, there is the cruise port in San Francisco. This port works very well for those wanting to explore the Pacific coast, visit Alaska, cross over to Hawaii and even take a world cruise. Popular cruise line sailing from San Francisco include Crystal Cruises, Cunard Cruise Line, Norwegian Cruise Line, Oceania Cruises, Princess Cruise and Regent Seven Seas. The San Francisco Cruise Port is within reasonable driving distances for residents of Nevada and California. The San Diego Cruise Port is ideal for those wanting to explore the U.S. Pacific coastline, visit Canada, check out the Mexican Riviera, See Hawaii and even traverse the Panama Canal to the eastern end of the United States. Popular cruise lines currently sailing from San Diego include Celebrity Cruises, Holland America, Norwegian Cruise Line and Disney Cruise Line with occasional itineraries. Heading north from San Francisco and San Diego gets you into Seattle, Washington. This port works well for residents of Oregon and Washington, looking for a no-fly vacation. From the Seattle Cruise Port, one can board a Carnival, Celebrity, Holland America, Norwegian, Oceania, Princess or Royal Caribbean cruise to Alaska. The bottom-line is that there is no shortage of no fly vacation opportunities from many embarkation points in the United States. Since most people live near the United States' coastline, most families are able to drive to a port for family cruise getaways. These vacations cost less than buying airplane tickets for three or more people. Plus no fly vacations are perfect for those who simply want to stay away from airports and airplanes.